In three Stanley Cup Final games against the San Jose Sharks so far, Pittsburgh Penguins centre Evgeni Malkin has no points. In fact, the Magnitogorsk-born 29-year-old enters Game Four on Monday night with no goals in the past six games and just one in his past 15. But to hear Malkin tell it, there’s nothing to worry about. He’s right to an extent, but a lot will hinge on Monday night. The Sharks could seize victory at the SAP Center and even things up. If that happens, Malkin’s lack of production will become a much bigger story and the Penguins will start examining their faults. It’s true that Pittsburgh doesn’t have to rely on the Russian’s scoring like they did in 2009, when he posted 36 points in 24 playoff games on the way to a Penguins’ Stanley Cup win. But it’s also true that Malkin’s performance still matters. A big part of the problem is a lack of opportunities. Plainly put, Malkin hasn’t been shooting the puck enough. He averaged 3.85 shots per game against the Tampa Bay Lightning in the Eastern Conference Final, but he only has eight shots in three games against the Sharks. This statistic is interesting in light of the fact that the Penguins have been outshooting the Sharks so far. Of course, San Jose is playing some pretty tough containment hockey against Malkin and that has allowed the Carl Hagelin/Nick Bonino/Phil Kessel line an opportunity to provide some offensive punch. 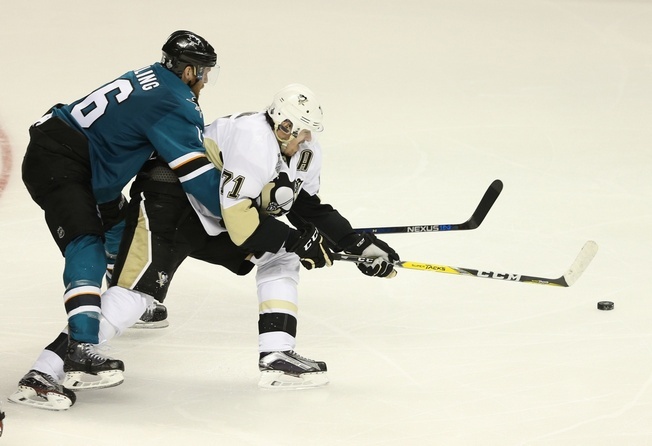 And of course, Joe Pavelski doesn’t have a point for the Sharks in the Stanley Cup Final. Joe Thornton, Logan Couture and Brent Burns are without goals. Look, these games have been close. All three of them have been decided by a goal and two required the extra frame. The difference between a 3-1 Pittsburgh series lead and a 2-2 draw is infinitesimal at this point and that’s why Malkin really has to get going. As clichéd as it sounds, he can start by putting some pucks on net.